In the fall of 2016 I was approached by Archie Comics to do some covers for them. I have to admit that I was so impressed with what Adam Hughes did with his work for Archie, it sort of inspired me to take on the challenge of doing something a little different subject matter-wise. In other words, I happily agreed to do some work for them. 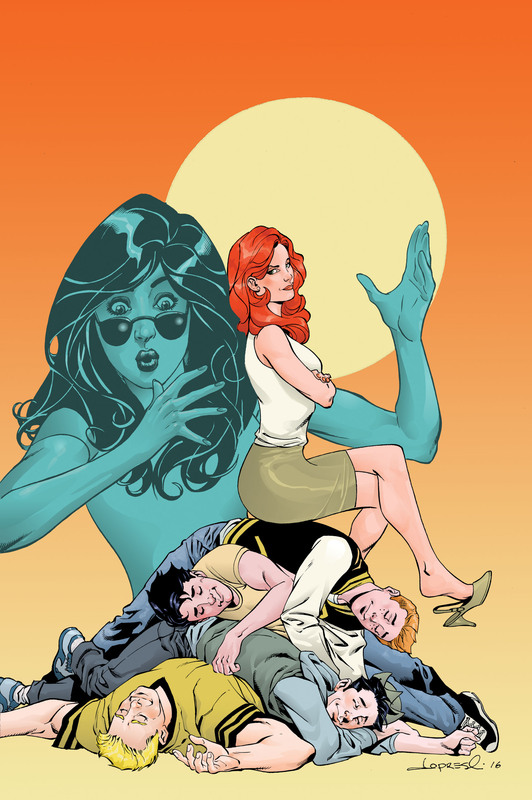 My first cover assignment from them was to do a variant cover for Archie #17. 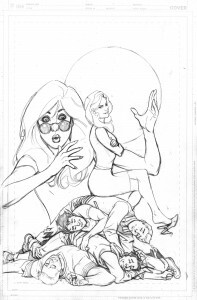 This was the final issue of the intro of the Cheryl Blossom story line. I was given the gist of the the story and came up with a couple of ideas that I think captured the theme pretty well. 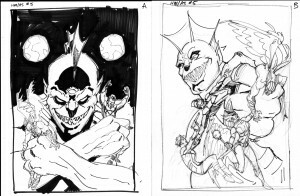 Quite frankly, I was excited to do either concept because I thought they were both pretty strong compositions that accurately conveyed the story. “B” was chosen, so that’s what I drew. I was able to grasp the more modern slant on the characters quicker than I thought I would. Once I was happy with the expressions and the figure work, I started inking. I did all of the inking with a brush except for the background circle. There I used a compass equipped with an ink pen. I scanned the piece and began coloring in photoshop. As is the case almost every time I color, I spent twice as much time coloring the piece as I did penciling and inking it. I went back and forth on the back ground color as I also usually do before settling on the orange fade. 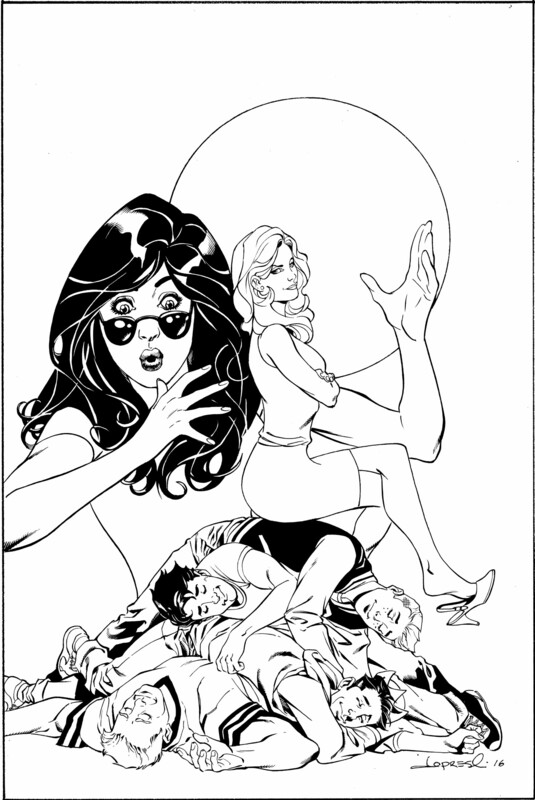 I knew that Cheryl Blossom and the guys were going to be warm and I also knew that Veronica would be a monochromatic cool color to push her back a bit. So the logical choice was to go warm again for the background. This is basically a orange-blue complimentary color scheme. I have to thank Adam Hughes for taking the time to share with me how he does his color holds, which I used on the Veronica figure in the background. It’s a simple trick of deleting the black line work and refilling it with color. Anyway, that’s the finished cover and that’s all for now! 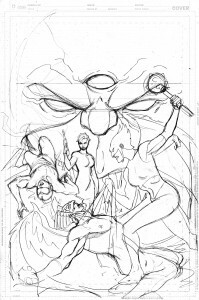 I desperately (exaggeration) wanted to get my blogging caught up (whatever that means), at least in regard to my Death of Hawkman Covers, so here I am with a another blog on that very topic. This was a hard one. 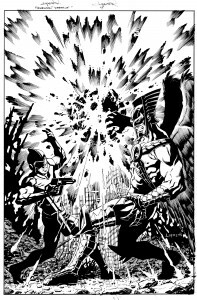 It was the last cover to a somewhat important and definitely eventful mini-series (Death of Hawkman, duh!) so it had to be good. What to do? Talk about pressure! I came up with several ideas in an attempt to capture the magnitude of the moment and here is what ended up on paper. 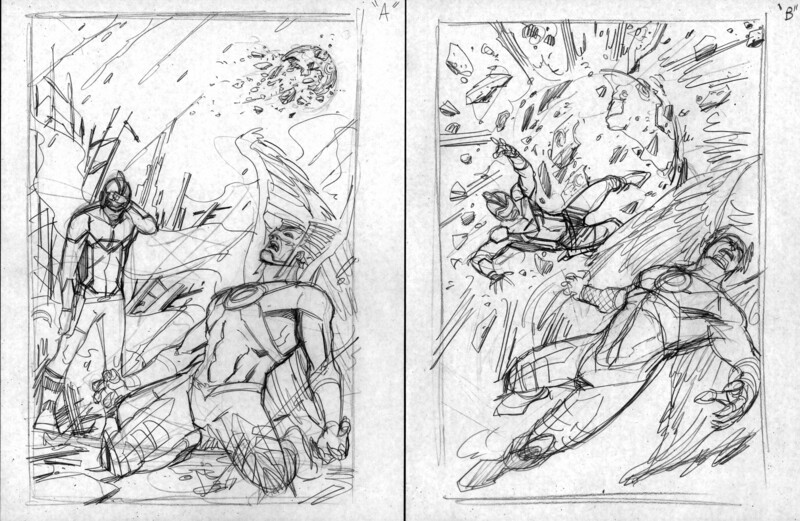 It’s not often that I draw four cover roughs and still not get it right but that is what happened here. My editor suggested something simple, stark and dramatic. 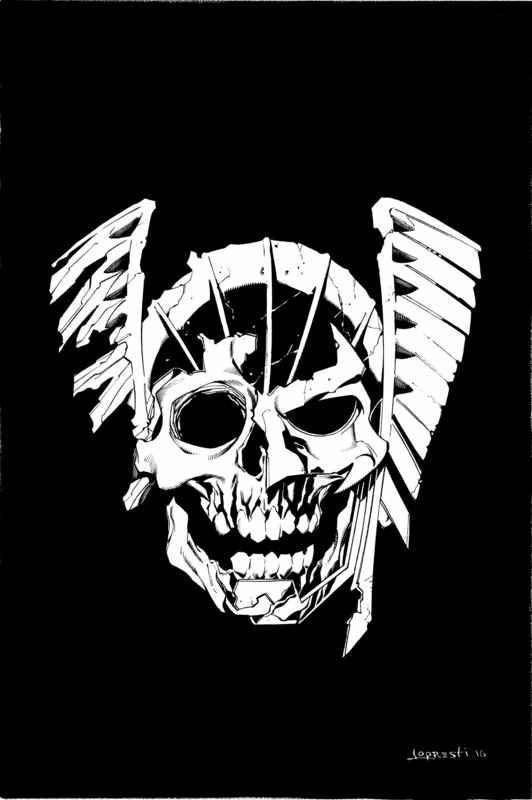 What about Hawkman’s skull? Great idea. Especially great when you are in a deadline crunch and don’t have much turn around time. So I took the concept, ran to my drafting table and did a quick marker sketch to make sure we were on the same page. 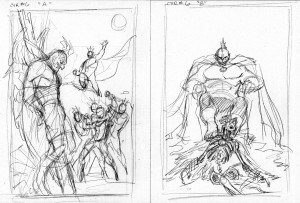 Once I got the okay, I pencilled the cover art. 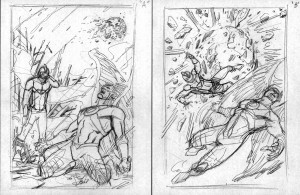 And in typical Lopresti fashion, I didn’t get a scan of the pencils. It might have seemed unnecessary to me considering the simplicity of the design. You’ll have to trust me that I did, in fact, pencil the cover before I inked it. Here is a scan of the inks after it was completed. Interestingly, I added the heavy blacks around his teeth and chin after I originally thought I was finished with it. I was getting ready to scan it and I just felt like there wasn’t enough volume to the illustration so I went in and added some black areas to create that depth that was lacking. After completing this stage, I did indeed scan it and sent it over to Brad Anderson for the color job. Brad once again took the black and white work and made it sing with a great color job. The added blood splatter was a nice touch. 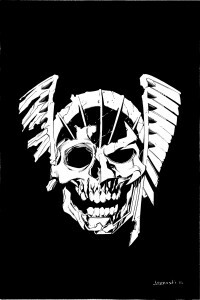 I think the simplistic yet dramatic design ended up being the perfect cover for the last issue of the Death of Hawkman. 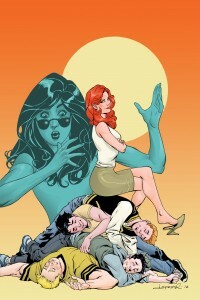 See you soon when I perhaps will delve into my work at Archie Comics. Ta ta for now! 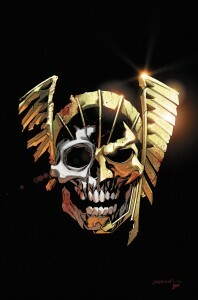 Let’s take a look at my cover art for Death of Hawkman #5. 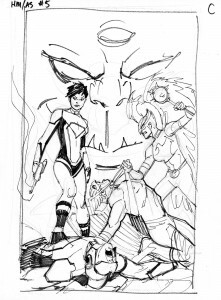 This is a cover where there was some indecision on my part as to what I wanted to do. I got some direction from the writer and my editor and then I tried to make sense of it all and come up with a strong image. It took me a few prelims to get there, though, and even then there were changes. Personally I would have gone with “A” or “B” but “C” was chosen with some adjustments. 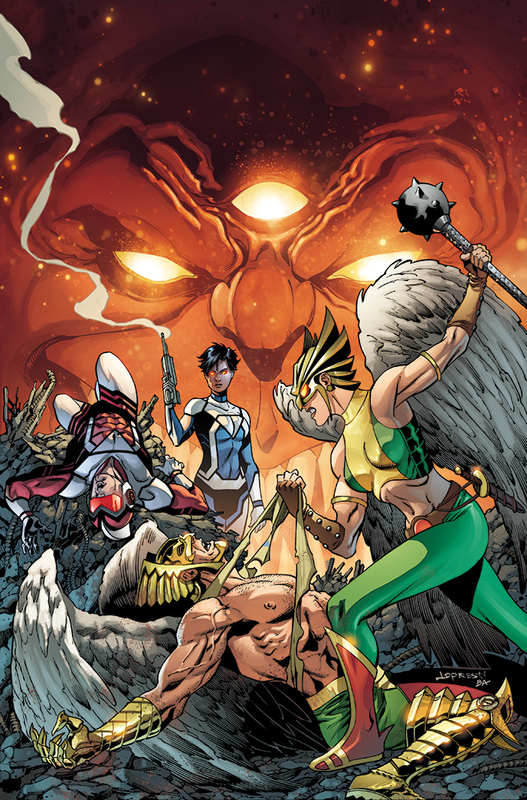 The powers that be wanted Hawkman and Hawkgirl moved to the front, which made perfect sense in retrospect. So I made the flip and produced a pencil drawing…sort of. 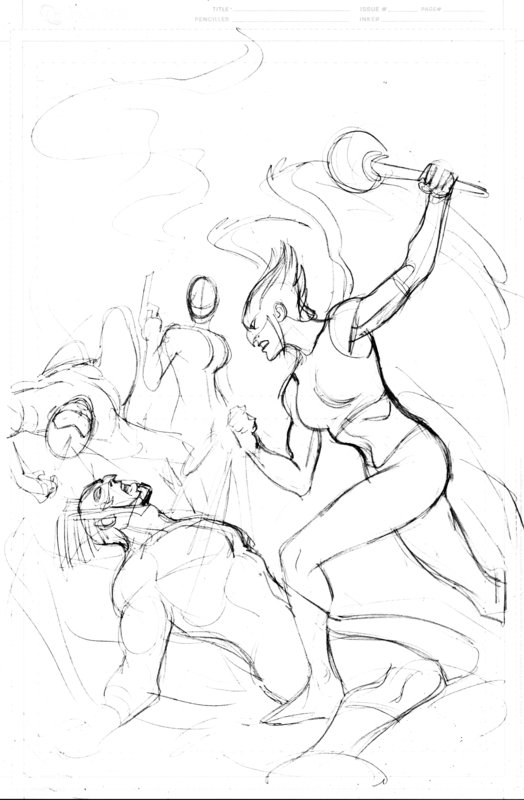 This is really more of a full sized rough to get approval after I made the change. This way I’m not investing a ton of time in something before I get a solid approval. After the new positioning of the characters was approved I went ahead and put in the other elements of the cover and the character details. Once again Brad Anderson jumped in and colored this with a very short turn around and did another great job. 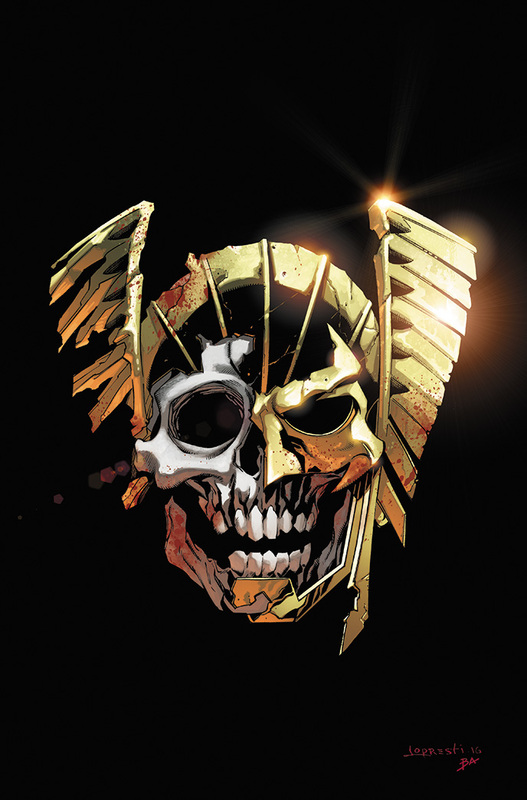 I’ll be back soon with the gripping saga of how the cover to Death of Hawkman #6 came to be! 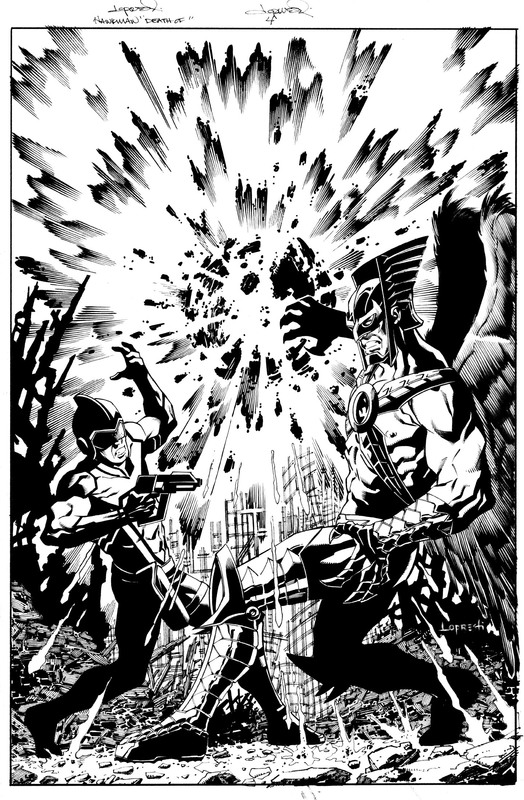 When I started this new Hawkman series for DC Comics, I was bound and determined to finally settle on a consistent look for my finished work. 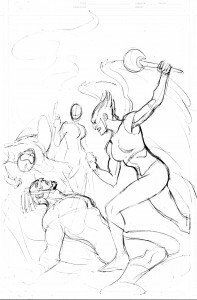 Those are things you can’t always control on the interiors because of the availability of inkers and what they bring stylistically to the finished work. 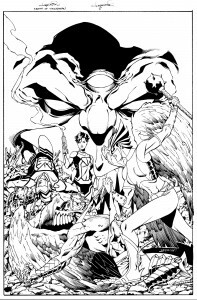 However, I can control that on my covers, illustrations and on some interiors depending on deadlines allowing me to ink myself. I am through experimenting with different tools and returning to my first love, the brush. Style has always been important in comics and being called “old fashioned” is never a welcome compliment ( I prefer “neo-classic”). 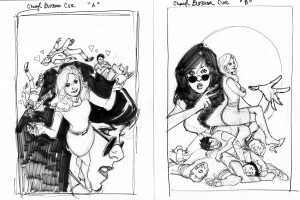 But I’ve realized that any style can be great and attractive to new and old readers as long as it’s well done. That’s the key. 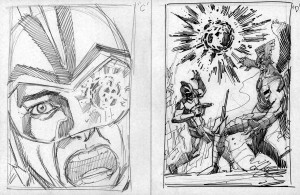 The composition, story-telling and draftsmanship are all part of the equation. In other words, it’s not about what you do but how well you do it. So instead of wasting time trying to constantly figure out what the reading audience might want to see or might react more positively to, I am moving forward doing what I do as best I can do it. Striving for what I always have, consistent growth. 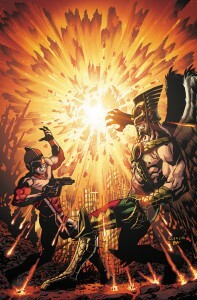 So with all of this firmly planted in our minds, let’s move forward with the cover to Death of Hawkman #4. 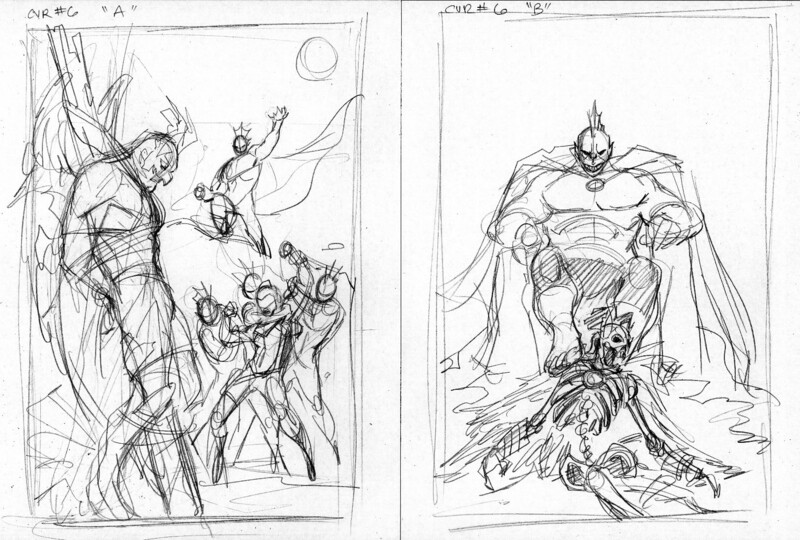 I really wasn’t 100% sure of what I wanted to do with this cover so the result of my indecision was 4 cover sketches. 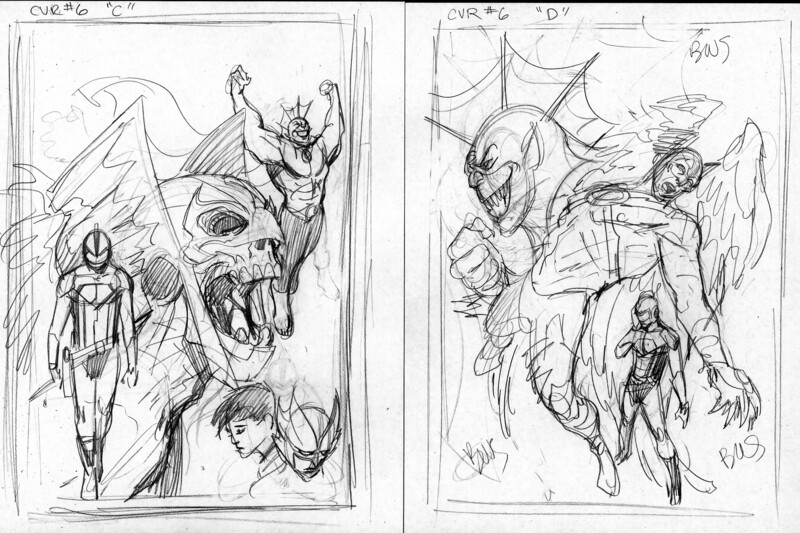 “D” got the green light so I moved to the penciling stage. 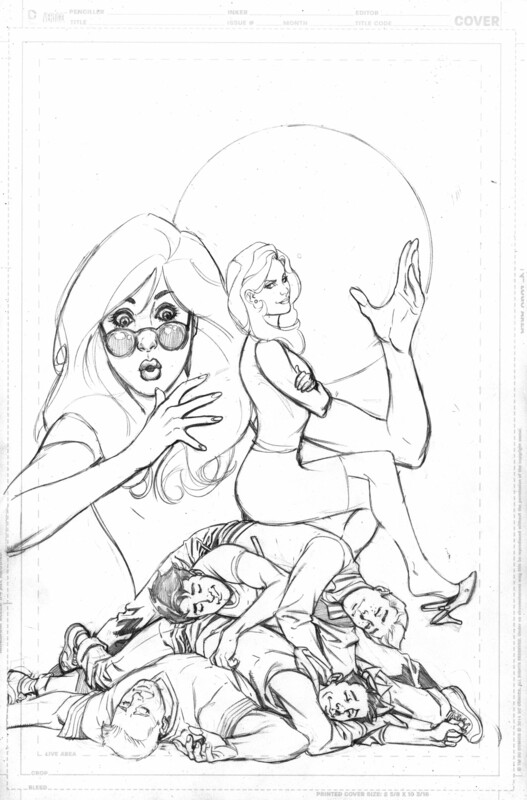 Unfortunately for some strange reason I don’t have a scan of the pencil for this cover. One of the hazards of inking yourself is forgetting to scan the pencils; something I have made a habit of doing. 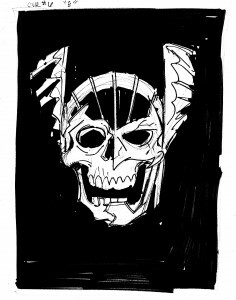 So let’s quickly move to the inks to save myself further embarrassment. 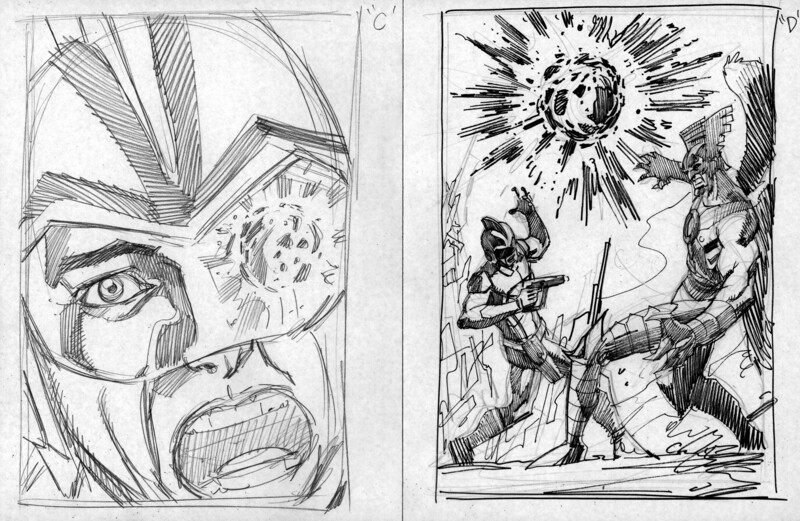 I inked the final pencils with a brush. The lighting effect along with the use of more solid blacks gives this cover a nice sense of drama and three-dimensional weight. As with all of the Hawkman covers, Brad Anderson is doing the colors. Brad is one of my favorite colorists in the business so it was no surprise that he did another great job with this one. There you have it. 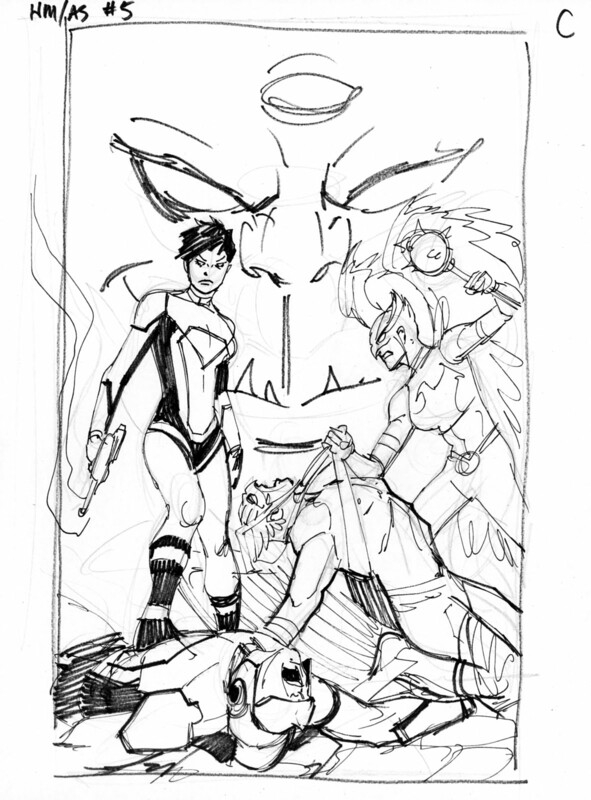 Another finished cover. 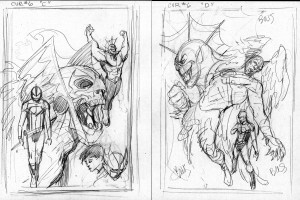 Since I am running way behind on my blogs and I have already finished covers #5 and #6, I will get those posted up here in short order. Until then….